Meanwhile, Mondo Gecko has a brief conversation with Wingut and Screwloose before they fly off. Kid Terra steers his raft out to sea, musing on his past life and the difficulty he’s having changing over to being a good person. Ray Fillet has led the Glublubs to a new place to live, but while he’s showing it to the little sea creatures, they’re attacked by sharks. Ray uses his telepathic abilities to call in some manta rays, who scare the deadly fish away. With the sharks gone, the Glublubs can live in peace in the coral reef. Ray bids is friends farewell and swims off to find Kid Terra. The two have a short exchange, Terra tells Ray that he plans to inform the local government about Null’s illegal dumping and help them clean it up. Ray hesitates for a moment, still upset over Kid killing his Glublub friend, but then shakes Kid’s hand, thanking him for helping to save the planet from Maligna’s invasion. Wingnut and Screwloose meet a huge flock of bats who are flying out their caves as the sun sets. Later, Mondo, Dreadmon, Ray and Leatherhead meet Jagwar at his palace in the jungle. Jagwar tells his friends his origin story and how his mother, Juntarra, had left six years ago on a quest to walk the Path of the Four Winds. Jagwar hasn’t seen her since that time, and he doesn’t know if she’s alive or dead. As the feline mutant tells the tale, his father, the Jagwar Spirit, arrives and informs his son that Juntarra is in grave danger and in need of help. Jagwar sees a vision of his mother in the eastern desert, being stalked and captured by Death. 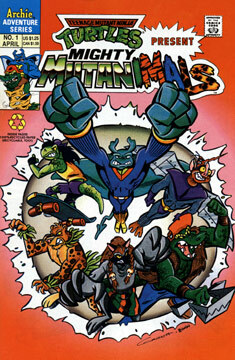 When Jagwar awakes from his vision, he and the other Mutanimals head out to save Juntarra.